With my interest sparked, I started doing research, in and out of the kitchen. Here’s a list of things that appeal to me about bison, a few recipes I’ve cooked up, and some buffalo resources. #(clear n1). Safe food. With buffalo the risk of mad-cow disease is extremely low, and to date I know of no reported cases. I also appreciate the results of sustainable farming: free-range, hormone-free, grass-fed meat. #(clear n2). Buffalo vs. beef. The nutrition profile of buffalo is impressive: High in protein and iron, low in fat. For those of us who grew up on beef — and like the taste, but not the fat — buffalo is a terrific alternative. #(clear n3). Buying buffalo. If you can’t find it in your local grocery store, you can always order it online. Local Harvest is a good resource for finding local, sustainable products. The National Bison Association also has an online buyer’s guide. In Portland, I discovered Pine Mountain Ranch at the farmers’ market. #(clear n4).What to look for. Buffalo meat is a deep ox-blood red. Be sure to ask where and how it was raised; don't assume that just because it's buffalo, it spent its entire life roaming the range. Some buffalo are fed or finished with grain, and there are buffalo feedlots, too. #(clear n5). [%image buffalo float='clear right' width=350 credit="Photo © Culinate" caption="Make fajitas with buffalo instead of beef. "]Cooking tips. Because buffalo is so lean, be careful to not overcook it. Steaks benefit from marinating first, and should be cooked carefully, on the rare side, to avoid dry, tough meat; hamburgers, too. That said, if hamburger is being added to a recipe (spaghetti, taco salad, etc. ), cook it as you would beef, until it's no longer pink. And typically tough cuts of bison can be treated in a similar way to beef: long, slow braising at low temperatures. #(clear n6). Recipe: Buffalo Chili. When you go looking for buffalo recipes, there are lots for chili. Try ours, which gets its smoky flavor from chipotle chiles and Spanish paprika. #(clear n7). Recipe: Buffalo Fajitas. 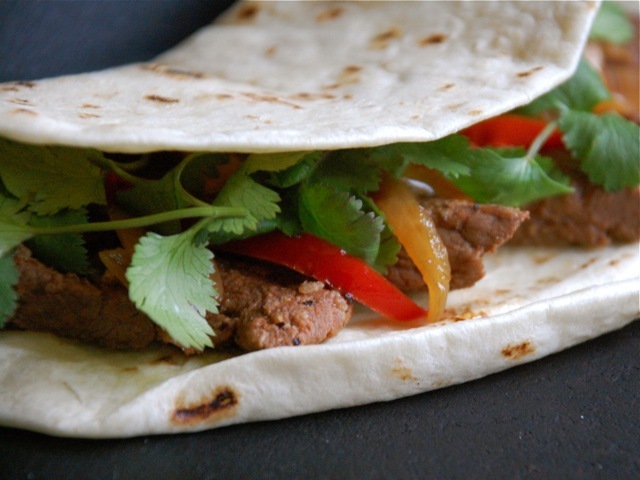 Marinate the meat overnight to maximize the tenderness and flavor; once cooked wrap the meat in a warm tortilla with sautéed onions and peppers. #(clear n8). Recipe: Buffalo Brisket in Tomato Sauce With Gremolata. Cook low and slow for a tender roast, then top with a zesty garnish of minced parsley, garlic, and citrus.